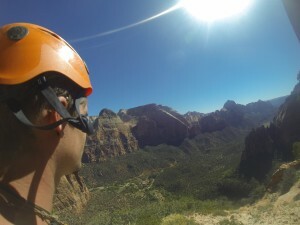 ZION NATIONAL PARK – Last week, during the first three days of the Zion National Park closure, a climbing group snuck in the first leg of their week-long climbing expedition – in an uninhabited Zion National Park. However, the park closure halted the second leg of their expedition which would have been an attempt at pioneering an original big-wall climbing route, that has never been attempted before – and filming it for a Zion documentary project. 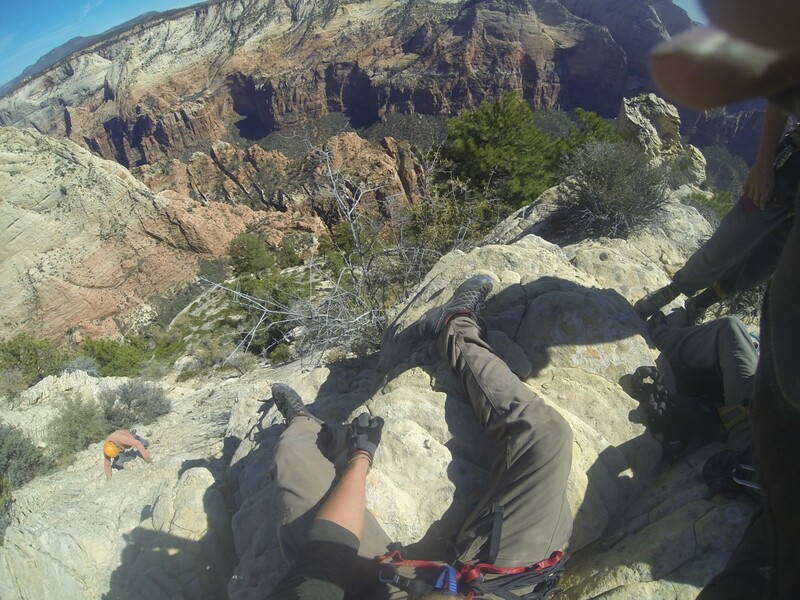 Last Monday, on the eve of the government shutdown, the St. George based climbing expedition showed up at the Zion National Park backcountry desk to get their permit to climb the first leg of their trek. They knew the park would most likely close the next day. For the first leg, they were planning on climbing an already established three-day climbing route up the face of “Issac,” a well known tower in the Court of the Patriarchs area of the main canyon of Zion. This climb is roughly two times the size of the 100 story Empire State Building. Because they were actually sleeping on the cliff for multiple nights, Zion National Park requires a permit. At the park’s backcountry desk, the ranger tried to discourage them from climbing, mentioning that the park would most likely close the next morning. Dan Kikkert, one of the members of the climbing group said that the group asked the ranger whether they could still get the permit, and the ranger conceded. Kikkert said that the ranger couldn’t withhold the permit because the park was still technically open. They had a decision to make, and decided to continue the expedition. “We were up there at that point,” Kikkert said. “We were going to do it either way.” The climbers were thrilled that their expedition could continue, so they set off towards the climb, wondering what would happen the next day. Dan Kikkert, 1500 feet up, climbing during Zion National Park closure, Springdale, Utah, Oct. 2, 2013. Courtesy of Dan Kikkert. They reached the base of the cliff Monday night as the sun went down and climbed for three hours in the dark – which was the plan all along. They set up their camp on a ledge hundreds of feet above the canyon floor. After a night spent on a cliff ledge, they woke up and noticed the shuttle bus system in the park wasn’t running and realized that the park was closed. They considered their options, and decided to keep climbing. “Once we were up there, that was it,” Kikkert said. Considering all the planning, hiking and climbing that had already gone into the expedition, they decided to finish it. “It’s not like they (the park rangers) are going to get there with a megaphone or anything,” Kikkert said. Kikkert and crew climbed the rest of the day, camped on the edge of the cliff Tuesday night and finished the 2,000-foot route on Wednesday morning. 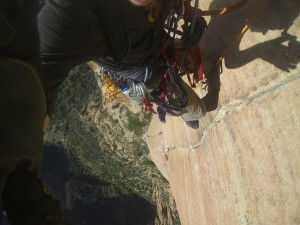 It took them five hours to rappel off the cliff and hike out until they got to the main canyon road. Up to that point, they were unaware that the road had been barricaded off. Planning on catching the discontinued shuttle bus system back to their car, they realized that they had to hike the last 1.5 miles to their car with 400 pounds of gear. They ditched their gear and started the hike back. Along the way, they were picked up by a Zion Lodge employee who dropped them off at their car. Kikkert said that on the way out of the park, they only saw three people on the road; a couple of pedal bikers, who seemed like they didn’t belong there, and a ranger who questioned them about why they were in the park. The ranger was pleasant with them and allowed them to drive back in the park to collect the rest of their gear, Kikkert said. Kikkert and crew could not return to the park to finish the second leg of their expedition which was planned for the very next day. The second leg of their trip was the capstone to the entire expedition. Since the difficulty of the route is unknown, it would have taken their group anywhere from four-eight days to climb, Kikkert said. They had already climbed the first 700-800 feet on previous expeditions but hadn’t finished the last 1,000 feet. Kikkert wanted to keep the location of the route secret until they had finished the first attempt. A climb like this takes months of work to complete, Kikkert said. They have been gradually hiking food, water and supplies out to the base of the route. Now that the park is closed, they can’t access their supplies. Kikkert and crew have no choice but to wait out the park closure and return to their expedition when it re-opens, as long as it’s not too cold to climb. To access more information on the documentary being filmed about extreme adventure in Zion Nation Park, and the Kickstarter fundraiser in place for its completion, visit the Rock of Refuge webpage here. Dan Kikkert and climbing party at the top of a three-day climb near the Court of the Patriarchs in Zion National Park, Springdale, Utah, Oct. 2, 2013. Courtesy of Dan Kikkert. Oh yeah, let’s worship these law breakers for their antics just like you would worship other criminals along the lines of thieves, abusers… Snuck into the park, knowing their actions were illegal. Let’s see, if they used their climbing equipment to climb all over the StG temple to spray paint graffiti on it, would you be cheering them? Maybe the National Guard units need to be mobilized to prevent criminals from these activities since your local law enforcement elements won’t do their job. Definitely Heros. Its nature, free to all. Besides, the Natl’ guard is also shut down. Don’t be sad that you can’t be as awesome. They are lucky they had no mishaps. I can’ t imagine how long it would have taken for emergency personnel to arrive. SAR is considered essential- they’re still around at all of the major parks. You seem to have a bit of a problem with your reading comprehension skills there, don’t you Not Heros. There was nothing law breaking about these guys. They started before the park closed, got their permit beforehand LEGALLY. Even if they discovered it closed halfway up the cliff, you would probably have considered them lawbreakers if they had descended while the park is closed. What were they to do, sit on the ledge until it reopened? sheesh, get a life. Chill dude. These boys got it done.